A storm cellar is an underground structure designed for people to take shelter in when a tornado is in the area. The entrance to the storm cellar is a concrete mound that extends out of the ground at an angle with doors on it and is typically on the side of the house or in the yard near the home. 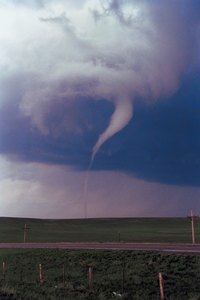 Because of its important role in keeping your family safe, maintaining the storm cellar, including preventing leaks, is important. Examine the gutter if it runs over the storm cellar. If it's clogged or leaks, the water can flow down onto the entrance of the storm cellar or the surrounding area and leak into the structure. Check the storm cellar doors for leaks. If the doors are in good condition, glue rubber gaskets around the perimeter to provide a better seal. If the doors are old, replace them. Repair any cracks in the walls and floor of the storm cellar or in the concrete at the entrance to prevent leaks. Repair the cracks by chipping away at the damaged area with a hammer and chisel, then filling the cracks with patching compound. Cover the walls and floor with waterproofing sealant to prevent water from leaking in. Use a paint roller to apply the sealant. Grade the soil around the entrance of the storm cellar so the water drains away from the entrance. Increase the grade by shoveling dirt around the entrance of the storm cellar and sloping it away from the entrance 6 inches over the first 4 feet. Tamp the soil down and plant sod on top to prevent erosion. Dig a drainage system along the edges of the storm cellar to carry away the water and prevent it from pooling next to the cellar. Standing water can increase its chances of leaking into the storm cellar. Dig the drainage trench 8 to 12 inches deep, fill it with 2 inches of gravel, then lay drain tile into the trench. Drain tile is perforated pipe designed to collect and carry away water. Fill the rest of the trench with gravel, and plant sod on top.